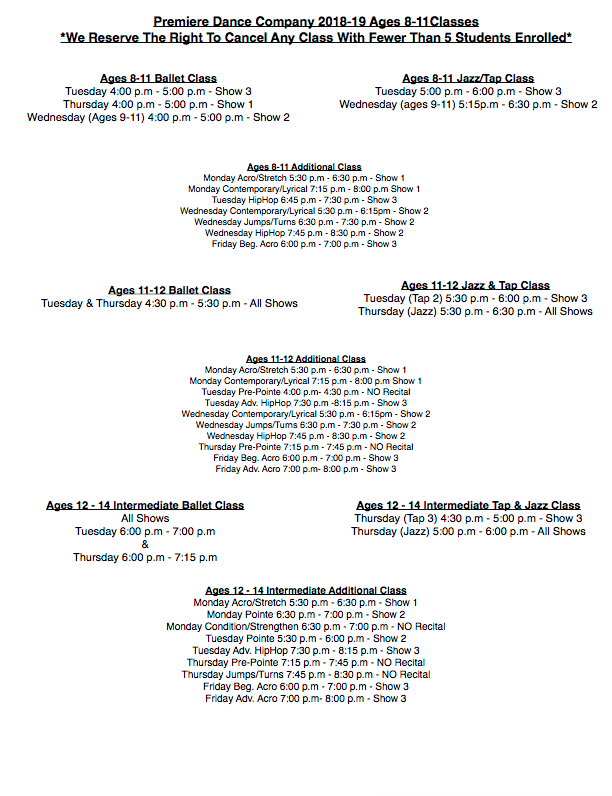 CLASSES ARE DESIGNED TO BUILD STRONG DANCERS WITH HIGH MORAL CHARACTER. ALL CLASSES ARE TAUGHT BY KNOWLEDGEABLE TEACHERS WITH EXPERIENCE AND A PASSION FOR SHARING THEIR KNOWLEDGE WITH ALL STUDENTS. 1. There is a $ 30.00 enrollment fee per student due within 48 hours of enrolling in a class, if not paid you will be automatically dropped from that class..
​2. Your first month of tuition (September) will be due June 15th, 2018 for the 2018*2019 dance year. 3. All tuition is due a month in advance beginning September for October's classes the first business day of that month. Late fees are assessed if payment is 10 days late. ACH payments will be taken out on the first business day of the month.